For over 38 years, Lyon Financial has provided individuals and families with the financial sources to enjoy the comfort and flexibility of having their own backyard vacation. We know what having your own pool will mean to you and your family. It means fun, relaxing times. It means creating a retreat to entertain friends and watch your children play. It means exercise, laughter, and a refreshing escape. Having a swimming pool allows you the opportunity and freedom to relax with friends and family, host summer parties, and make lifelong memories. 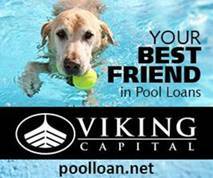 Viking Capital Loan Specialists give personal attention to every borrower and take the time to understand their financing needs and qualifications. Once the loan is secured, Viking Capital stays connected to the borrower, the builder and the lender to answer questions, provide status updates and ensure the funding process goes smoothly. Their multiple loan options have low rates and longer terms than common unsecured loans offering more affordable monthly payments. LightStream delivers a revolutionary swimming pool loan experience that allows customers to focus on their home improvement purchase, rather than on their financing. With innovative lending products and proprietary technology, consumers with strong credit profiles can receive highly competitive, fixed rate financing via an easy, fast and virtually paperless loan process. You control the terms of your LightStream swimming pool loan, repaying your fixed-rate home improvement loan in as little as two years, or take up to 12 years. When you have good to excellent credit, the choice is yours. Paramount Capital is a free service designed to help customers find and obtain sound financing solutions for their backyard dreams. They are not the lender, but they do work with multiple lenders nationwide in helping customers find financing. Once they receive your pre-application, they will help you through the process of choosing a lender program that best fits your needs. Their no fee and no obligation service to find the right lender for you is the reason why they are the leaders in the pool industry. Fill out the pre-application and take one step closer to swimming in the pool of your dreams.